When Murgatroyd’s mom, Suzanne, walked down the petal-strewn aisle carrying the couple’s 6-month-old son, Shai, “I lost it,” admitted Chmerkovskiy. But that was nothing compared to his first glimpse of Murgatroyd in an ivory, pearl-encrusted Karen Sabag Couture ball gown, cathedral-length veil and heels she purchased during their first visit to Ukraine in 2012. “By the time she appeared, I was so emotional, I didn’t care what it looked like,” he says of his tears. (Murgatroyd cops to avoiding eye contact with dad Derek: “I would have had no makeup left!”) As alumni of the ABC reality show — including Candace Cameron Bure, Nyle DiMarco, Chmerkovskiy’s best man and bother Val and Amsale-clad bridesmaids Rumer Willis and Sharna Burgess looked on — the duo’s close friend Greg Havio led a 30-minute nondenominational ceremony that they wrote themselves. “It has both of our cultures mixed in together,” says Murgatroyd, who performed the Jewish tradition of walking around her groom seven times. For the grand finale, the pair, whose on-off relationship spanned five years and include a dramatic onstage proposal in December 2015, exchanged self-penned vows. Chmerkovskiy admits his delivery was rocky. “People were telling me, ‘You’re going to see her walk down and you’re going to know exactly what to say,’” he says. “What they didn’t say is, ‘You’re going to see her, freeze up and forget what you wanted to say.’” But his words still touched the New Zealand native, 31. 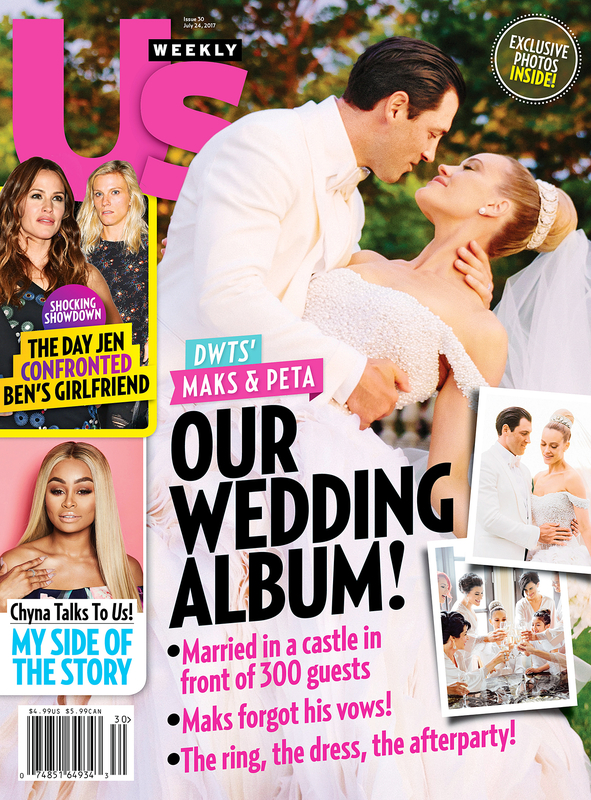 For more exclusive photos — and details on the pair’s raucous reception — pick up the new issue of Us Weekly, on stands now!